World leaders vowed yesterday to revamp the global financial system in the face of recession fears, but US President George W Bush urged nations to “recommit” to free markets despite economic turmoil. Wen confirmed China’s participation in a crucial summit in the United States on November 15 aimed at tackling the financial meltdown, without specifying which Chinese leader would attend the meeting of 20 industrialised and emerging powers. But Bush, moving to set an agenda for the upcoming international economic summit, said its participants must “recommit” to the principles of free enterprise and free trade. “As we focus on responses to our short-term challenges, our nations must also recommit to the fundamentals of long-term economic growth – free markets, free enterprise, and free trade,” Bush said. After a week of growing economic gloom and plunging stock markets, Asian and European leaders meeting in Beijing promised wide-ranging reforms while UN Secretary General Ban Ki-Moon also called for quick change. 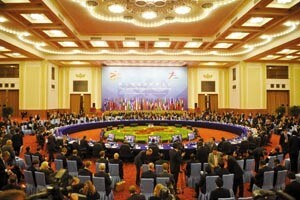 “Leaders pledged to undertake effective and comprehensive reform of the international monetary and financial systems,” the 40-member Asia Europe Meeting (ASEM) said. Ban said the Washington meet must address the need for change and joined chief executives of key UN institutions in calling for considered but large-scale reforms. “The market and regulatory failures that have led to this crisis must be addressed as a matter of urgency,” a joint statement said. Volatility has surged across financial markets and was particularly violent in foreign exchange trading on Friday, with a swathe of major and emerging market currencies sold aggressively in favour of the US dollar and the Japanese yen. Russian officials pledged to prevent sharp fluctuations in the rouble, but said there was no need to limit capital movements or change the trading corridor of the currency, which hit two-year lows versus the dollar this week. Emerging economies have been particularly hard hit by the crisis, forcing many to plunder their foreign exchange reserves to defend their currencies and financial systems. Officials in Washington said those economies that qualify for a proposed new liquidity fund at the International Monetary Fund could be eligible for an unusually high level of funding. Although the details of the package were not finalised, the plan, which may offer countries up to five times their IMF quota, could be approved as soon as next week. It would allow certain emerging market economies to exchange local currencies for US dollars to ease short-term credit strains, the officials said..